It’s that time of year again for us to bring you some great 4th of July crafts ideas. We love making fun projects like these to celebrate the heritage and freedom of the United States. Not only are they ideal for the 4th of July, they are great for Memorial Day! I have chosen a few super easy 4th of July crafts and ideas that you can decorate your home for the summer. Most of these have easy tutorials or free printables. 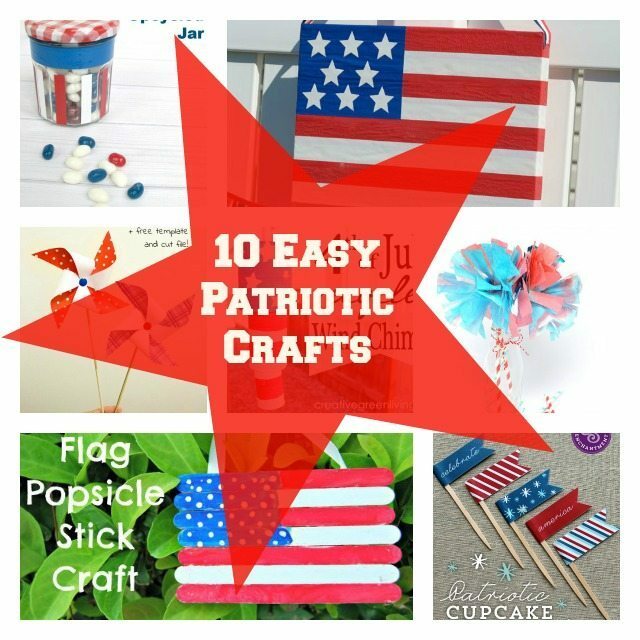 The end of the school year is hectic but you still have time to create some of these great Patriotic Arts and Crafts. Depending on the ages of your kids, you can easily turn these into Crafts for Toddlers or Kids. DIY duct tape Flag is perfect for any door. Plus, who doesn’t love playing with duct tape?! 4th Of July Silverware Holders are so fun and classic on your table! Kids will love helping you turn an old mason jar into a simple flag! Kids love to play with popsicle sticks and make this easy patriotic flag craft. It’s a great way to keep them busy and having fun! How to make a Pinwheel is a great kids craft that will be perfect for your 4th of July celebration. Adorn your trees with this adorable patriotic Recycled Tin Can Wind Chime. Such a fun way to add 4th of July crafts to your home and lawn decor. 4th of July Craft Noisemakers are perfect for kids to make and have fun ith during fireworks shows! Easy Layered Bean Votives are perfect for displaying on your guest tables for a 4th of July picnic! 4th Of July Door Wreath is made easy using patriotic colored bandanas! Need party favors then make these adorable Patriotic Candy Jars for your guests to take home! Make this adorable stars and strips wreath for you door to let your neighbors know you are proud to be an American. Homemade 4th of July Crayons are easy for kids to make while you prepare your meal! For the homeschooling families, here are some 4th Of July Learning Activities that get kids active! Do you love making fun 4th of July crafts? This list is a great place to begin! This list of great 4th of July crafts ideas is truly a fun way to get your kids active and occupied while you focus on the recipes you’ll make for your friends and family. Whether you are making decorations together or sitting the kids down with some activities to keep them busy, this list is ideal! These crafts would be perfect for my niece and her friends to make for the 4th of July. I think she would enjoy making the Popsicle Stick Flag and the Patriotic Candy Jars. What a great list of crafts to do for the 4th of July! The kids love doing crafts, thanks for sharing!